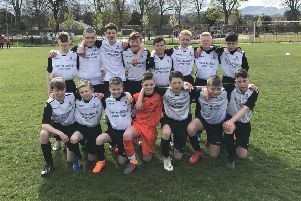 Ten-man Danderhall Miners exited the Scottish Amateur Cup at the fifth-round stage as they were narrowly beaten 2-1 by Hamilton FPs at Danderhall Recreation Park. Hall looked the livelier of the two sides early on with Hamilton taking time to get into the game. The visitors slowly got into the tie and Danderhall had to be careful as they passed the ball around well in the final third. As the half progressed, the game swung more in Hall’s favour and they almost grabbed the lead with 30 minutes gone. Daniel Taylor’s free-kick on the right was met with a header by Grant McMillan that landed just wide of the left-hand post. As the half wore on, there were few chances for either side but Hamilton made their mark when it mattered. Andrew Duffy smashed in a loose ball inside the box from his side’s corner to make it 1-0. Danderhall started the second half in determined fashion with McMillan volleying straight at the keeper. But, just ten minutes, into the second period, they made things harder for themselves as James Laing got himself sent off for a second bookable offence. The ten men didn’t quit, though, and, with ten to go, they equalised through Mark Brown’s driving run and finish. But instantly Hamilton replied with what would be the winning goal as Connor Ferguson took advantage of some poor defending to score from close range. Edinburgh Star made an ideal start to the new year as they eased past Blackridge Vale of Craig 4-1 in the Anderson Cup second round. Star got things underway at Saughton 3G and had the ball in the net with just 13 seconds on the clock. Scott Coleman quickly ventured down the left-hand side before feeding debutant Andrew Cosgrove, who made his mark with a neat finish in the box. Blackridge were stunned by the start their opponents had made and they never really recovered. The scoreline soon got even better for the hosts. Aaron Ormiston cut inside from the right to hit a cracking strike on his left foot into the Blackridge goal. With 20 minutes on the clock, Star deservedly extended their lead. Ormiston bettered his first goal with a majestic second as he hit a deft lob from range that carried just under the Blackridge crossbar and in. Before the break, Blackridge hit back with a goal from Chris Drummond but, in the second half, Star made sure of the win thanks to Scott Davidson as he rounded off a clever team move to make it 4-1. North Merchiston Vale eased into the third round of the Centenary Cup with a comfortable 3-0 win over Armadale Thistle at Harrison Park. Vale picked up where they left off over the Christmas break and it wasn’t long till the hosts’ pressure paid dividends. Fraser Seywright broke to the byline before cutting the ball back across for Simon Leslie to fire in from close range. Thistle struggled to get going in the game with Vale working tirelessly off the ball to retrieve possession. As the half progressed, Vale continued to attack and were unlucky not to have doubled their advantage. Into the second half it was a similar story with Vale well on top. With 20 minutes to go, Vale’s Lewis Mitchell was fouled in the box and the referee awarded a penalty. Eoin Anderson stepped up and, although he failed from the spot, he finished off the rebound. Vale wrapped up the victory late on with a third. Mitchell bagged himself a goal as he rifled the ball into the roof from the left-hand side of the box.